Our Surgeon: Parag Parekh, M.D. Our Clinical Director: Michael J. Talone, O.D. What happens after my consult? Myopia, or nearsightedness, means that your eyes can see close objects clearly but struggle to see things in the distance. Nearly 30 percent of Americans are nearsighted. This condition usually develops in children and teenagers, up to about the age of 20. A teacher or parent might notice a child squinting at the chalkboard or TV. Other common symptoms include headaches, frequent blinking and rubbing of the eyes and failing to notice distant objects. If the curvature of your cornea — the clear part on the front of your eye — is too steep, you will be nearsighted. Myopia can also be caused by an eyeball that is too long, relative to the lens’ and cornea’s focusing power. Light entering your eye will not be correctly focused, causing things in the distance to look blurry. However, what causes these defects is still under debate. Heredity and visual stress are leading contenders. If both parents are nearsighted, the child is at higher risk. Examples of visual stress include excessive reading, computer use or other tasks that demand the eyes to focus on close objects. Note: Myopia due to close work is sometimes temporary. Eye problems can also be symptoms of other disorders, such as diabetes or a cataract developing in the eye. Eye doctors test patients’ vision by having them read letters on a Snellen chart that is placed about 20 feet away from the patient. Your doctor may also use lighted instruments to determine the focusing power of your eyes. Sometimes, eye doctors use eye drops to dilate the eyes. This temporarily prevents the eyes from changing focus, so he or she can examine them more easily. Once your eye doctor finishes the test, he or she can determine whether you have myopia. If you suffer from myopia, you and your eye doctor will discuss possible treatment options. Eyeglasses are the most commonly prescribed and least invasive method of treating myopia. Depending on how nearsighted you are, you might need to wear glasses some or all of the time. 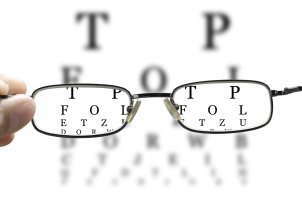 If you also have trouble seeing things close-up, your eye doctor might prescribe bifocals. These let you see both far and close objects more clearly, and are popular with patients over the age of 40. Contact lenses can provide a wider field of vision and may let you see more clearly. However, because they are worn directly on the eye, they need extra care and cleaning. Contact lenses are not recommended for those who are squeamish about touching their eyes. Orthokeratology, also called corneal refractive therapy, involves wearing rigid contact lenses that reshape your cornea’s curvature. This therapy changes how light enters your eyes, eventually making your eyes focus correctly. The results from orthokeratology are temporary, and patients must continue to use these specialized contact lenses to maintain results. Laser procedures such as photorefractive keratectomy and LASIK have become more prevalent over the last few decades. With laser vision correction surgery, the ophthalmologist uses laser energy to remove a small amount of corneal tissue, thus reshaping the curvature of the cornea and correcting the refractive error that is causing myopia. Highly nearsighted people may be better suited for another type of refractive surgery, including refractive lens exchange (RLE). The ophthalmologist implants a corrective lens directly into the eye. This lens is placed either right in front of the eye’s natural lens or it replaces the natural lens entirely. Many treatments are available to myopic patients. Call our practice today, so we can help you decide which one is best for your visual needs and lifestyle practices.